St Kilda's Tom Hickey and Carlton's Matthew Kreuzer in action on Friday night at Melbourne's Etihad Stadium. 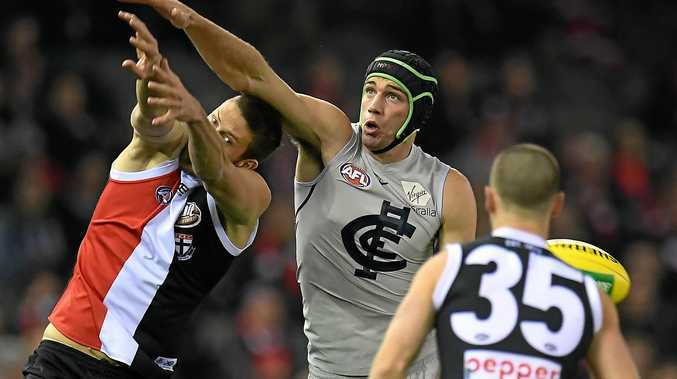 CARLTON will monitor Matthew Kreuzer following its loss to St Kilda on Friday night, with the ruckman becoming the latest AFL player to suffer a heart irregularity. Kreuzer left the ground during the first quarter at Etihad Stadium and played no further part as the Saints cruised to a 16.20 (116) to 7.10 (52) victory. It was initially thought Kreuzer had hurt himself in a tackle, but the Blues later revealed he had suffered shortness of breath and an elevated heart rate. It came a week after young defender Caleb Marchbank was taken from the ground during Carlton's loss to Brisbane and sent to hospital after also suffering an elevated heart rate. Marchbank was cleared by a cardiologist and lined up for the Blues against the Saints. Kreuzer did not require hospitalisation but will also undergo tests during the week. "He had shortness of breath and quite randomly, you wouldn't believe it, an elevated heart rate," coach Brendon Bolton said. "He's okay now. It settled down pretty quickly but we weren't going to take any risks with that. "We'll go through all the testing processes with a cardiologist like we did with Marchbank, who was fine this week. "It's quite a random thing. I haven't seen it and particularly haven't seen it two weeks in a row." Kreuzer's absence forced Carlton to improvise with Charlie Curnow, Liam Jones and Harry McKay sharing ruck duties. St Kilda defender Dylan Roberton continues to undergo tests for a heart condition after collapsing midway through the Saints' game against Geelong in round four. Roberton has not played any football since the collapse and will miss the rest of the season, but he has been on the training track recently. Collingwood rookie Kayle Kirby has also been ruled out for the season after suffering an irregular heartbeat. Tests revealed an underlying heart issue.